I have been subscribed to BirchBox for a few months now and I must admit I have been disappointed with the last couple of boxes. Until this one! 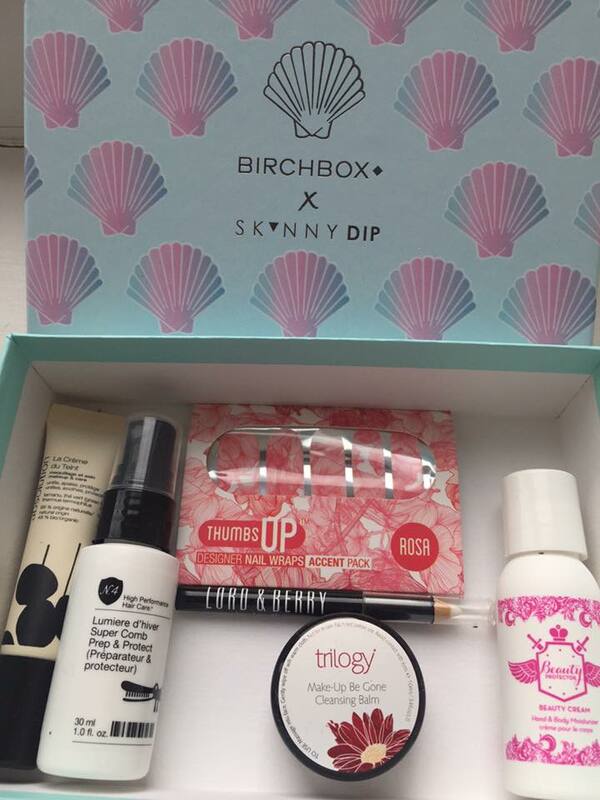 This moth BirchBox teamed up with SkinnyDip London. They had an extra option this month giving you the opportunity to pay an extra £4 to get a SkinnyDip phone case retailing at £12. Sadly I missed this offer due to moving hour which is why I received my box so late because I forgot to change my address! This months box had the SkinnyDip logo and their signature design. I am obsessed with mermaids (the little mermaid in particular) So this box design was right up my street. I have been wanting to try a cleansing balm for some time now so i was super excited when I saw this in my box, the only downside I have is I'm not too keen on the scent. This product really intrigues me as it is a clear, yes you read right, clear lip liner. therefore you can use this with any colour lipstick you want but it still does the job of a lipliner! I can't wait to see how this works out. 3. Number comb prep & protect. This product claims to strengthen and repair tired stands as well as detangling and taming flyaways. I have never been that big on using hair care products as i have never had any hair concerns as I have never died my hair. But I am starting to want to try out some hair care products. This product is essentially a BB cream I'm not too sure how this will work for me as the formula looks very pink and light. I have natural olive skin and I also fake tan so I will just have to see how this works for me. This band is popular for their hair products so I am looking forward to seeing how well this moisturiser works. I think even if it doesn't moisturise my skin i would skill use it and repurchase as the scent alone is AMAZING!! These nails wraps are so pretty! I think I will be saving them for spring/summer though as I end to wear dark polish around this time of year.